I’ve been struggling for a few weeks trying to come up with a subject to write about. For the time being, I’ve been living and working in Morocco for the past 9 months so I can assure you that by now I have plenty of stories to share which makes it quite hard to decide which one would be the best one to start with. 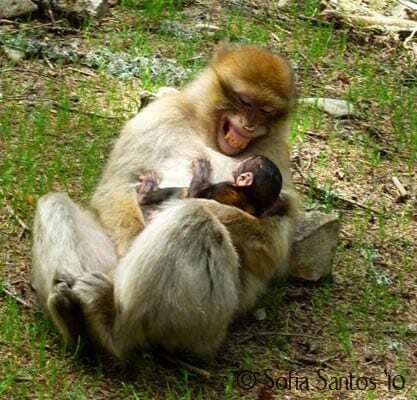 So I decided to start from the beginning: birth and first stages of existence within the Barbary Macaque species. Here we could argue about when does life actually starts, birth, conception or in a vast number of development stages of pregnancy but I”ll just skip that issue because I can assure you that I do not have the academic background to engage in such a controversial discussion. Infants, or how I like to refer to them in my mind “mini monkeys”, are one of the most adorable little creatures I have had the pleasure to watch and work with. I’ve seen all of them from their first day in this world, a few still covered in blood and with the umbilical cord. I’ve watch them struggling to walk in their weak and numb limbs and I’ve watch them fail and try time after time after time. I’ve seen their “jumping phase” where they would climb a small rock and jump and jump and jump all day long. I’ve seen them starting to understand how to climb on their mothers or soliciting males and hold on as much as they could while the adult would almost fly up a tree in an amazing speed that would make me shiver in anxiety thinking that they were not going to be able to hold on and fall dozens of meters down. 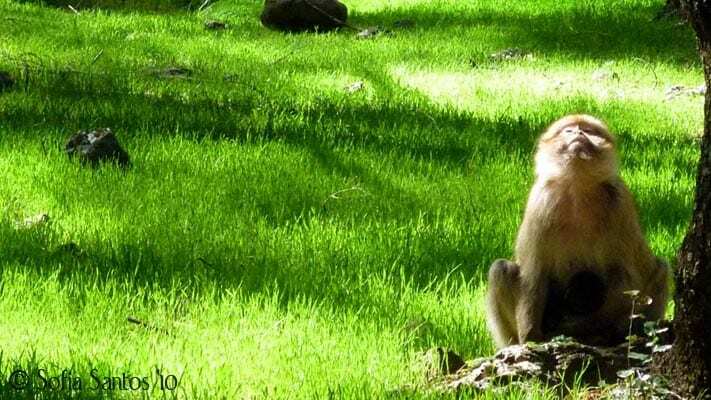 All my fears were obviously not realistic because for what I’ve noticed by now, mini monkeys are incredible strong creatures and I’ve even watched one of them falling 7 meters down a tree and walking out of it like nothing happened (I can assure you that the entire group got quite agitated when that happen though). The first new born of the green group came on the 28th March, a little boy that soon was the centre of attention within the entire group. Everyone wanted to peek at the little piece of heaven and the entire dynamic of the group completely changed after that day. Rebecca’s little boy, the first newborn of 2010’s birth season. 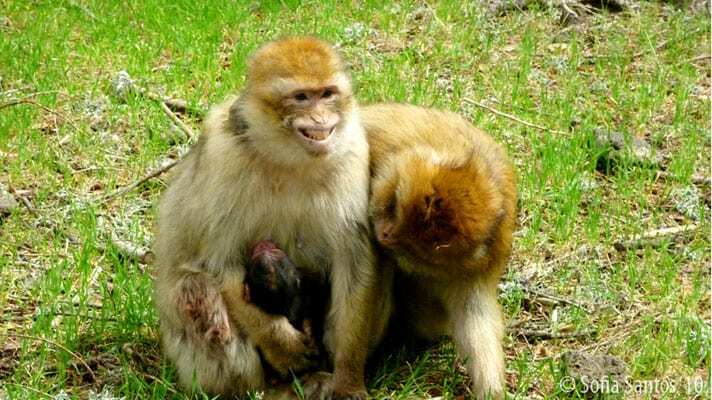 On the next day another baby boy was born, this time from Anna, the dominant female of the group and the births went on until all the females of the green group were carrying a baby, a total of 7 infants, 3 males and 4 females were born in less than a month. Anna resting with her newborn after, what I would have call, a rough night. Helen still quite covered with blood after giving birth to her baby girl. In few days after the first infants were born, we start observing the males trying to get and keeping them sometimes for almost half the day. 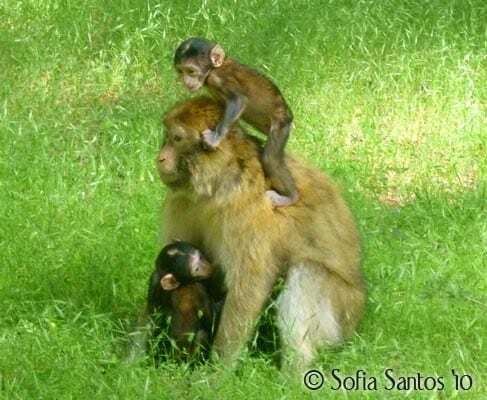 They walked around with the little ones, sometimes just embracing and teeth chattering the infant but most of the times “using” them to do sandwiches with other males (a very common social behaviour among adult males). Lewis, an adult male, asleep with an infant after a very busy afternoon. 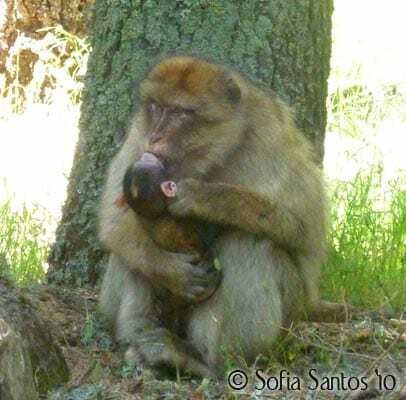 Larsson, a young adult male, teeth chattering and playing with a newborn. Nick (on the left) sleeping with Mac (on the right) while both embrace an infant (in the middle). In the following weeks we start observing the infants beginning to walk on their own and trying to slowly explore their surroundings. Their hair was still quite dark compared to the other members of the group and their ability to master some of the basic body movements made them quite an entertainment to watch. 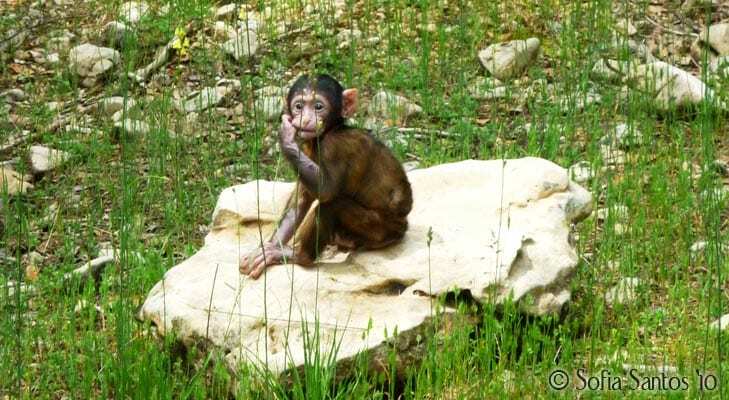 Their face was still quite wrinkly which made them look like and old man instead of a young monkey. Infant with their characteristic hair colour. Dakota (on the left), an one year old juvenile born in the previous birth season (2009), with an infant from this birth season (on the right). Close-up of a face of an infant where you can see the wrinkles. 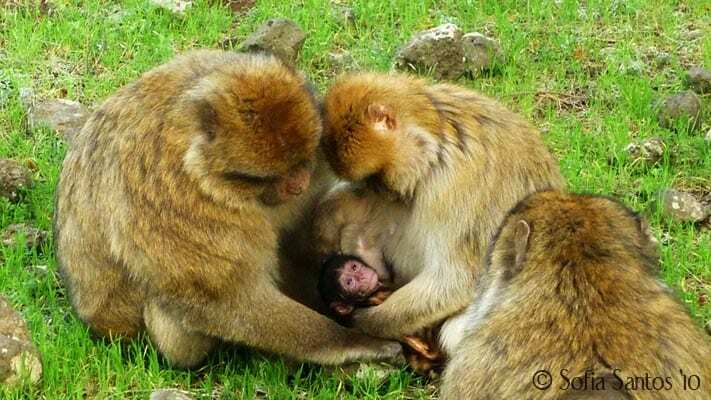 Both juveniles and adults are incredibly patient when it comes to infant behaviour. The little ones were allowed to be as annoying as they could possibly be without any kind of repercussions so we could often observe infants jumping from adult to adult while they were trying to rest or groom and being groomed, pulling their hairs or biting them while the adults would just let them play and mess around without any kind of punishment. Infant jumping and playing on top of Oz (lying down) while he’s being groomed by Noddy (on the left). Kerry being extremely tolerant while having an infant from another female playing on her head and pulling her hair and ears. Among the green group there is a peripheral adult male, George, well known by his lack of social skills. 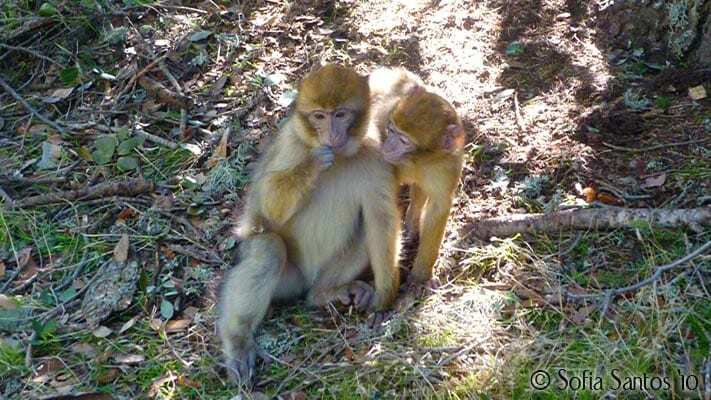 He doesn’t seem to adapt to the Barbary Macaque social life as well as the other members of the group and he’s often seen alone a few dozen meters away from the rest of the monkeys. 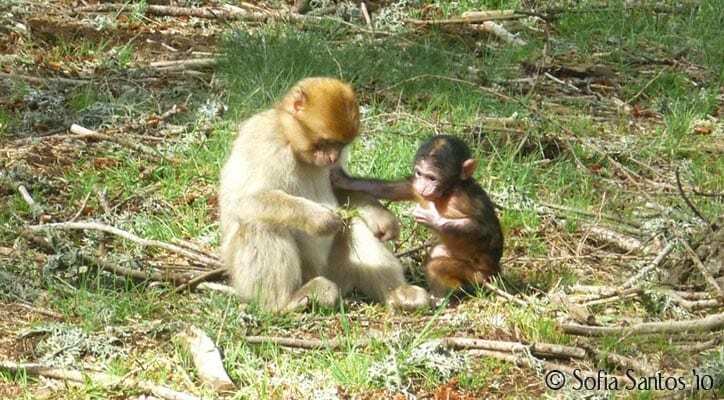 As you may imagine he was also a bit curious about the new members of the group and one day, during the month of June, he managed to “get his hands” on one of the infants. I expected him to “use” the infant in his advantage to try to get closer to the other adult members without fear of being aggressed but instead he got the infant, ran away with him, sat far away from the group, held the little boy’s neck to keep it steady and proceeded to kiss him.. I can assure you it was one of the most bizarre moments I’ve ever witnessed. There was this awkward adult male, holding a small infant by his neck while keeping lip contact with him for more than 2 minutes straight for no apparent reason. I managed to get a few photos of this memorable moment. Months went by and Summer came. 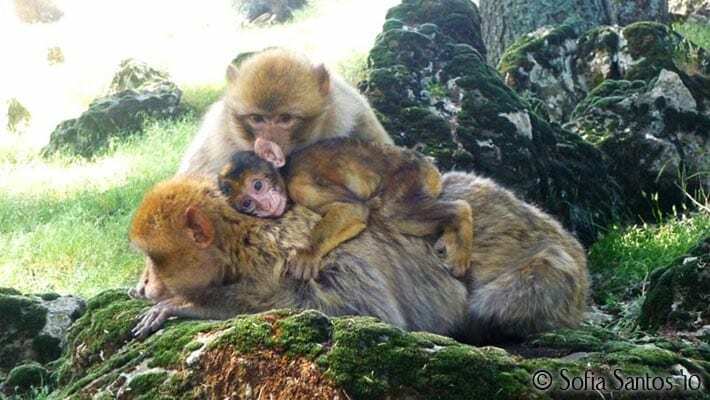 The infant’s hair slowly started to get a more golden tonality and their ability to move, climb trees and play with the juveniles and other infants steadily increased. They went from being daily handled by adults only (their mothers or adults males trying to socialize with other males) to spend the day mostly with juveniles. While in the beginning the adults would pick them up whether they wanted or not, after a few months they were strong enough to walk on their own and reject solicitations and even run away when an adult tried to get them which allowed them to be a lot more independent and funnier to watch. Mac (on the back) with Simon (lying down) carrying an infant on his back. You can see his hair slowly going from dark brown / black to slightly golden on some areas. Slowly the infants start to (try to) feed on their own mostly by watching what the other members of the group were feeding on, then by trying to grab a piece and slowly understanding the mechanisms that are part of the holding, chewing and swallowing process. Infant (trying to) feed on an unknown item. Unfortunately not everything was perfect. The 16th July 2010 , a friday, was the last time we saw all 7 infants in the green group. 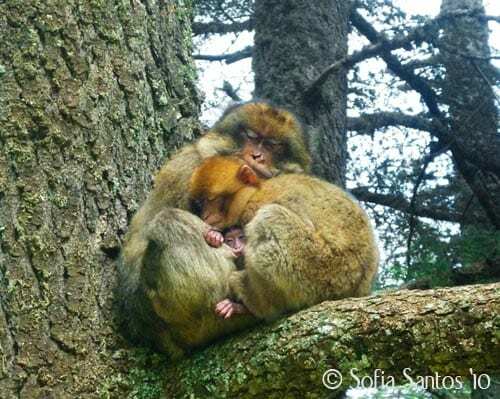 When we returned to the forest on the next monday I noticed that there were two females that I hadn’t seen carrying an infant during the entire day. I immediately thought it was just my own distraction, after all, the infants were getting quite independent and was getting harder and harder to catch them with their mother and trying to recognise each of them individually was an almost impossible task. On the next day I decided to focus on those two females just to get some peace of mind but it turned out to be one of the saddest days I had on the field. On that day I realized that those two infants were gone. Helen and Joan weren’t carrying mini monkeys any more and that really left a mark in me especially because I had grown quite attached to Helen’s little girl by then. For the next days I tried to observe those two females in order to analyse if I could spot any kind of grieve or sadness in them. I was just trying to see if they had any kind of feeling for those little girls they lost or if they had just moved on like that was a common event. I was desperately anthropomorphizing them for my own relief. I still don’t know if those two little girls left any kind of scar in their mothers or not but they surely left on mine. I managed to get a photo of Joan just two days after the event. She was a bit away from the group, sitting quite still in the middle of the road looking at the empty space. I’m not sure if she was just tired, distracted or grieving but watching her like that made me quite sad. Joan after losing her infant. Unfortunately those two little girls were not the only ones that disappeared, a few weeks later Neo’s infant also went missing and we were left with only 4 infants, three little males and a little female. 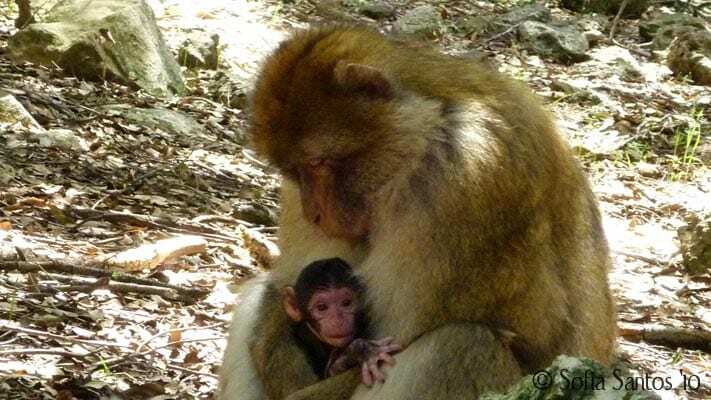 The remaining infants kept growing up and developing like any normal Barbary Macaque. 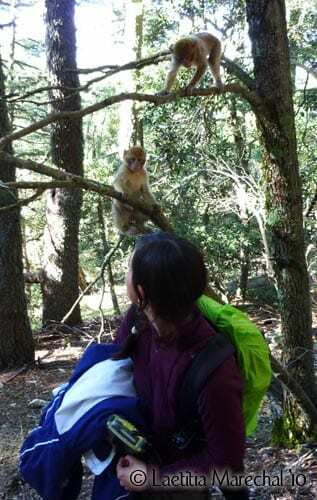 They grew up more curious and more interested in us (researchers) and it start getting more and more common to see them climbing up trees near us just to peak from above. To be fair I never discouraged that behaviour, I believe it’s healthy for them to explore and to slowly start to understand that we are not a threat but at the same time I do have some limits and I do not allow them to touch me at any give time. Playing around me is perfectly ok, playing with me is crossing the line and I’m sure that this little detail makes a huge difference in order for me to be in the group and collect data without feeling that I’m somehow influencing their natural behaviour. Two infants peaking at me from a tree. Now the infants are getting quite big and their hair has the same colour as all the other members of the group, this golden / beige tonality. Sometimes when they are close to the younger juveniles (from last birth season) we can see how much they grew up in only a few months. If you notice several paragraphs above where I showed you a picture of Dakota and an infant next to each other you’ll realize the difference between the little one’s size with the following photo. Krissy (on the left), a one year old juvenile born in the previous birth season (2009) next to a infant from this birth season. To end this (quite big) post I would like to share a video I made on one of the days I was being “inspected” by a few infants. I was next to a small tree finishing collecting data when I saw a few little ones running and climbing up the tree next to me. They quickly proceeded to peak and try to approach me to take a better look at my bag’s cover (the immense green thing you can see two photos above). Somehow that item of mine seems to attract their attention occasionally. I quickly took of my camera and started to record that moment. 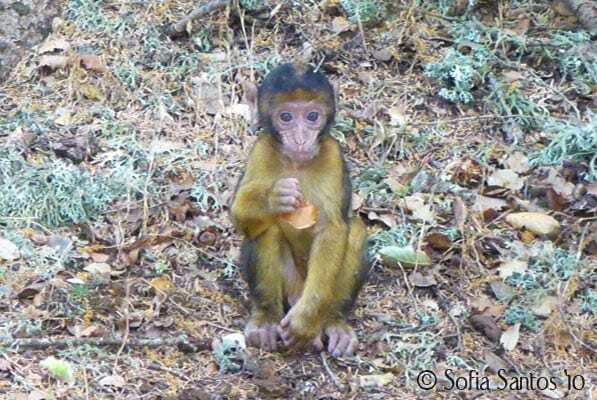 Hope you liked to read about the mini monkeys and seeing the photos and video. i hope your candles were made from soy. Seems like it was a magical time but such a shame about the tragic losses. That’s of course the perfect video for the entry!